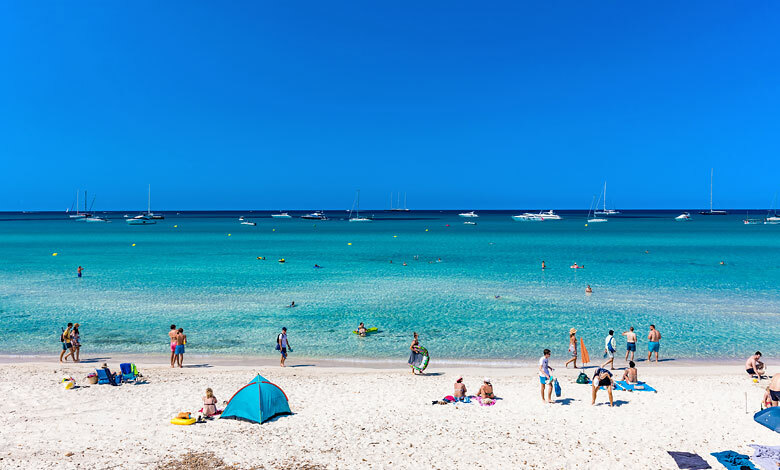 Es Trenc is located in the southern part of Mallorca between the very small town Ses Covetes and the larger holiday resort Colonia Sant Jordi. 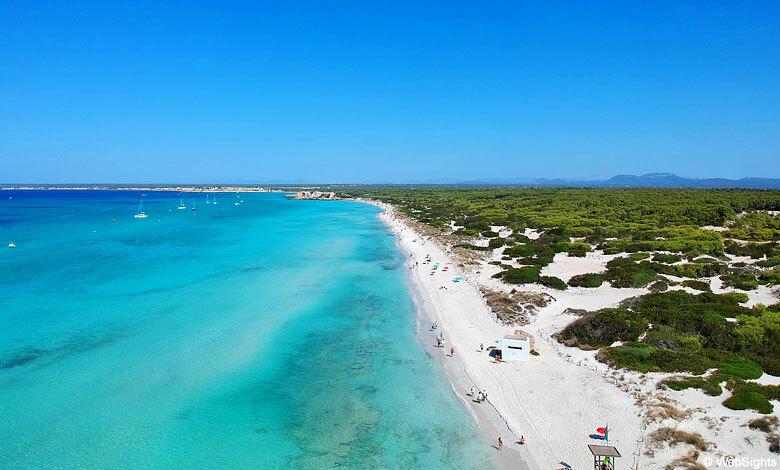 Es Trenc is the most famous beach in Mallorca and the last large natural beach, which is not spoiled by big hotels and dozens of restaurants. The beach is now located in a national park, so hopefully no hotels or the like will be built close to the beach in the future. 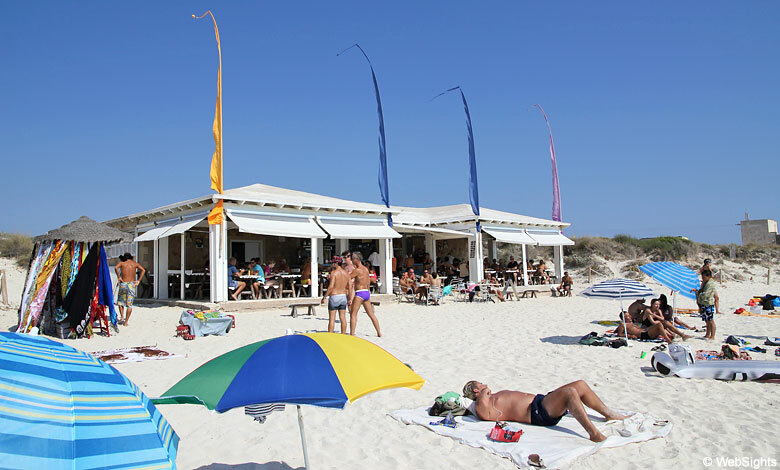 Es Trenc is more than two kilometres long and covered with fine-grained, bright sand. In the back of the beach, there are some lovely dunes, but it is not allowed to stay there. The water is shallow along all of Es Trenc and the unique, turquoise shades give the beach an almost tropical look. This is one of the most beautiful spots in Mallorca. In the water, there are often sailboats, catamarans and yachts of all sizes at anchor. They are calmly rocking on the waves and, luckily, the beach is not plagued by noisy water sports activities. Es Trenc is the most popular naturist beach in Mallorca, and there are several marked sections for naturists. The majority of the visitors do, however, wear swimsuits. There are several parking lots with payment, which can be reached by following the signs to Es Trenc. It is worth noting that the beach usually has many visitors in July/August. The beach is very child-friendly. Lovely sand and very shallow water. On days with onshore wind, there may, however, be relatively high waves. There are a few restaurants and cafés along the beach. Here you can enjoy the lovely view of the beach and the water along with your meal. In the small town Ses Covetes, there is a mini market. So far, the authorities in Mallorca have managed to keep Es Trenc free of hotels and they recently prevented a giant construction project close to the beach in 2015 via the Spanish Supreme Court. The nearest holiday resort is Colonia Sant Jordi, which is located just over one kilometre south-east of Es Trenc. This is a medium-sized and relaxed holiday resort with several good hotels and restaurants. To the north-west, you will find the small town Sa Rapita, which has many private holiday apartments and a large marina. However, there are not many hotels in Sa Rapita. The beautiful beach Es Trenc from above. The beach stretches for over 2 kilometres in completely unspoilt surroundings.